Nico Rosberg tightened his grip on the Formula One title race with a dominant victory at the Japanese Grand Prix yesterday. 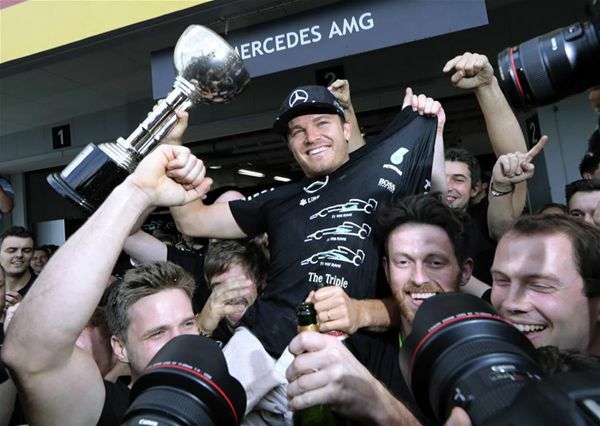 Mercedes driver Nico Rosberg won the Formula One Japanese Grand Prix in Suzuka on Sunday. Rosberg, who started from pole position, controlled the race throughout and finished 4.9 seconds ahead of Red Bull driver Max Verstappen, who held off Lewis Hamilton in close racing over the final few laps. With four races remaining Rosberg holds a 33-point lead over teammate Hamilton. The result assures Mercedes of the constructors' championship for the third straight year. It was Rosberg's ninth victory of the season and 23rd in F1, moving the German driver into a tie for 12th place on the all-time list with Nelson Piquet. Ferrari driver Sebastian Vettel finished fourth ahead of teammate Kimi Raikkonen. Every driver finished the race, only the seventh time in 952 world championship races that has happened.